Enjoying my time outdoors involves, in part, me becoming part of the moment. There is much to observe, and that directs me to connect with the experience, to be in the moment of snowfall. What are some of the things I try to draw my attention to? How is the snow falling on me? Can I listen to the pitter of flakes on my hood? It is an amusing move to be able to regularly sweep snow off myself, when it accumulates. On days like today, it can soak my jacket. Can I find spots to I watch from? Benches will need to be swept off. Having water-resistant pants helps me find more spaces I can sit. I also enjoy spending some time standing or sitting under trees. That allows me a break from snow falling on, or hitting my face. It allows me to set up camera shots without foreground snowflakes blurring the larger scene I am trying to depict. Today, I was lucky enough to notice how, while standing under a tree, I could isolate flakes falling and watch them. Enough of the snowy sky was blocked that I could focus attention; enough of the snowfall was blocked that I could look up. How is the built environment designed to allow snow to stay where we can appreciate it? Think of how many beautiful snow pictures you have seen which involved houses. Or which involved looking at snow on familiar landmarks of a city. Certain objects – awnings, statues, roofs – can serve, at least temporarily, as sites which winter can transform. Sites where we can enjoy this strikingly visible aspect of nature. I grew up in the suburbs, which have some elements designed in a way that keeps snow visible. The high percentage devoted to lawn space sets up a landscape that is mostly flat, and thus can easily be submerged under, say, an inch of snow, leaving most of the yard for snow to cover and drift over. Roofspaces can perform a related function. The driveway gets shoveled – little else is. 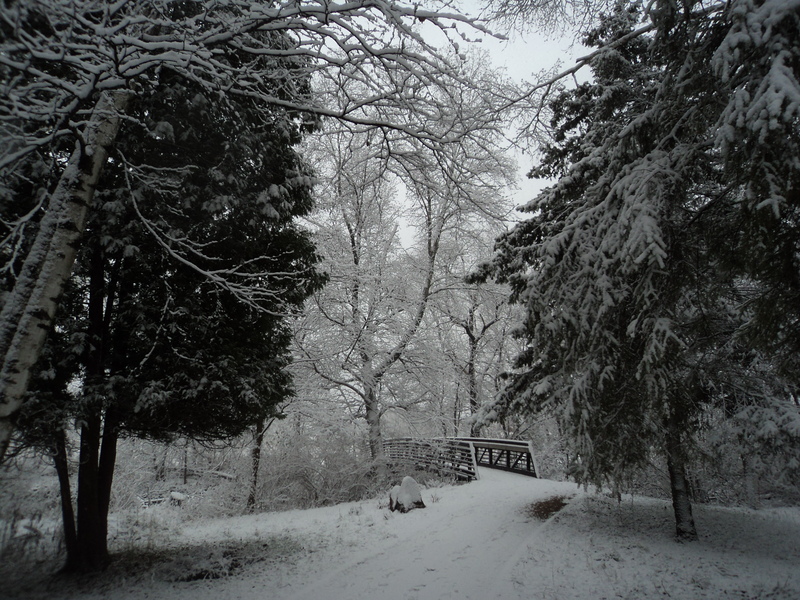 Today, in the nature center, I could observe how the bridge gets ‘decorated’ during a snowfall. How can we use architecture and urban planning to harmoniously design our places so that we can enjoy the beauty of interplay between nature and culture, all year-round? In other spaces, snow is removed more quickly. Roadways and sidewalks get cleared. Spaces reliant on them – and without benches, statues, or other design elements on which snow can be allowed to sit – quickly are mostly emptied of snow. Who else is out, and how are they enjoying it? Listen for the voices of children having fun, in particular! They are less constrained. And they are less likely to assume that snow means burdens which one should be frustrated be – more likely to look for opportunities to be creative and enjoy it. What artifacts or marks can I find that provide signs of how people enjoyed themselves? If they found joy in such a moment, I also find a little joy in seeing what they left behind for others like me to be entertained by! This can be basically a small visual gesture. But it is also striking. In other seasons, it is rarer, and trickier, to create such ‘natural/weather sculpture.’ Andy Goldsworthy does it superbly; what I have more often seen are piles of rocks clearly shaped by a constructor. Snowforts and snowpeople offer us the chance to send a signal to others, a signal of the joy we found in reshaping our environment (and doing so in a sustainable fashion) while enjoying the outdoors. How does snow sit in different trees? 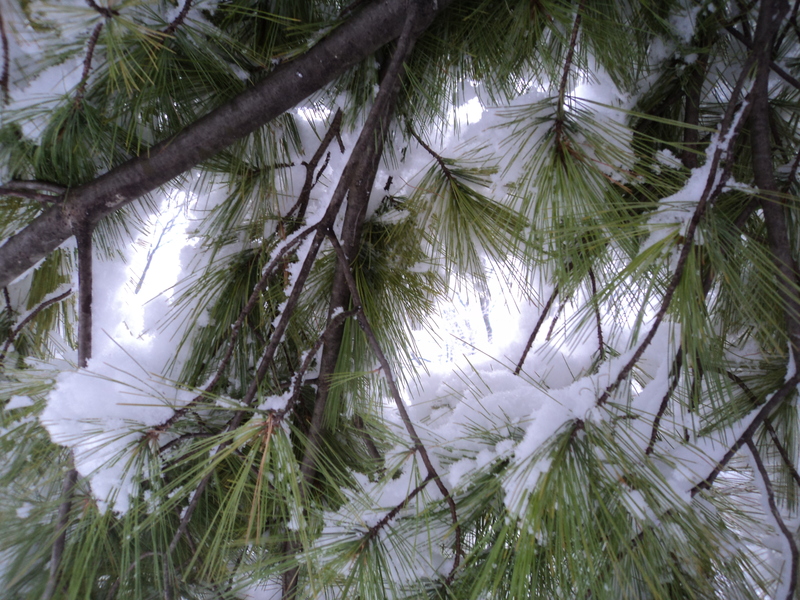 To explore this question, it helps to head out during, or shortly after, a snow which clings to branches. 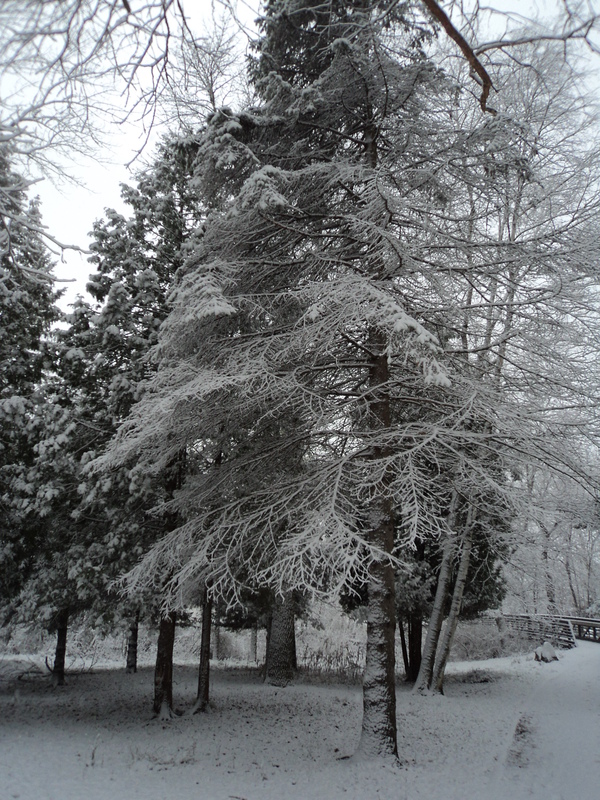 Snow does not tend to stay long in trees. But while it is there, one can keep an eye on how certain branches get coated (sometimes with ice as well), and what effect a skeletal structure now white rather than brown has; how thorough the coating is, how much the sun brightens in, and more. On trees which keep leaves or needles, how can snow pile up in bunches on it? How does each branch have a slightly different set of details in its balance of how snow hangs from it, extends it, coats it? How do – particularly if one looks from underneath – green and brown still project themselves, leading to striking complements between the colors. We just had our first real chance this year to observe some of this in Wisconsin. I hope you will keep these questions in mind (and come up with your own, which you might share with me!) as you keep appreciating what our natural world has to offer! 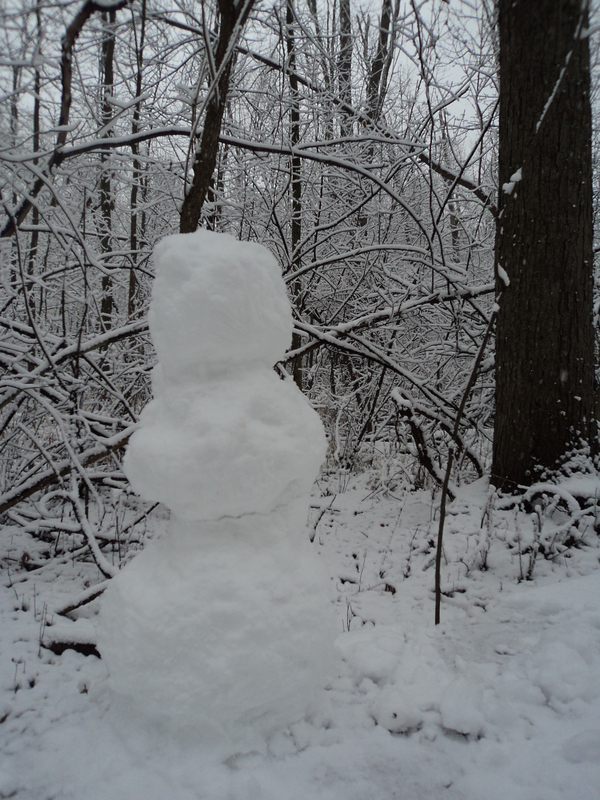 This entry was posted in Observations, Photo Gallery and tagged snow photos, winter images. Bookmark the permalink.